Also called permeation or chemical grouting, soil grouting is a process designed to improve the soil around a home to provide extra support to the foundation. With soil grouting, special low viscosity non-particular grout gets injected into the soil, and it moves into the pores of the soil, causing it to harden. In most cases, the process starts by drilling a hole in the area where you need additional support. Depending on the situation, the foundation contractors may put in temporary supports around the hole. Then, a sleeve port pipe is put into the hole. A sleeve port pipe can be a variety of lengths depending on the projects needs, and it has several ports positioned up and down the pipe at a 90 degree angle to the main pipe. These holes may be covered with a sleeve and a tapered ring. Once the pipe is in the hole, it’s connected to a pressurized grout dispenser. When the grout is released from the machine, it moves through the pipe, out of the ports, and into the soil. At that point, the soil grout moves through the soil, finding homes in the pores of the soil. Because this process is so discreet, it can be easily done with an existing foundation. During the soil grouting process, the contractor watches the result, and they adjust the volume of grout, the pressure, the flow rate, and various other factors to ensure an effective result. 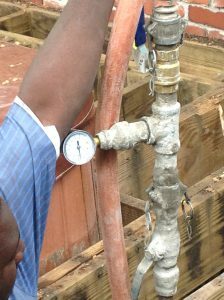 While choosing a foundation contractor, ask about the tools they have for this process. The more monitoring they do, the more accurate and sustainable the results will be. As the soil grout takes effect, it hardens and creates a mass similar to sandstone. Prior to the soil grouting, the soil in the area is often sandy and it easily shifts around. As it gets strengthened through the soil grouting process, it becomes almost solid, and as a result, it can provide the support it needs to provide. 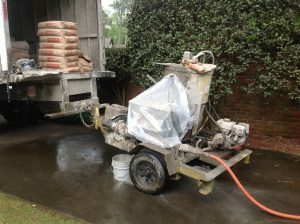 One of the repair solutions for cracked slabs that Atlas Piers of Atlanta offers is Soil Grouting and Compaction Grouting. These techniques are used to stabilize the soil and repair the effects of settlement for many times of structures and surfaces. The most common application would be for garage slabs, basement floors and patios. If you believe that you need soil grouting, we can help. At Atlas Piers of Atlanta, we work on both residential and commercial foundations. We can look over your existing foundation and let you know which type of support system would be best for it. We also build new residential and commercial foundations. To learn more, contact us today.